Day two of the UK Board Games fell upon us after too little sleep and too many (if such a thing exists) board gaming. In fact, we got so much done today that we’ve had to split this article in two to make it more manageable. We’ll chat you through what we found out over the day and the evening separately. Jouni Jussila, founder and CEO of Playmore Games kindly took the time to chat about their new App. Designed for all mobile platforms, ‘Dized’ guides players through their first time playing a new board game. We all take a moment to commiserate how daunting we’ve found playing seemingly complex games with dozens of bits to set up. He fires ups a prototype of the Dized on a nearby tablet and starts the tutorial for ‘Race from the North Pole’. The app starts asking about how many players are playing and guides the players through the set up. Sure enough, on the second turn, the step by step guide changes to checklist of actions that have to be completed for the turn. We talk a little more about where Jouni sees the app going after its initial release. We wander over to the Devir booth and delay Gracie Glowiak’s, head of Exports, lunch to ask her about their new games. After accepting our (sheepish) apologies, she chats us through ‘Fanhunter’, a miniatures game which sits alongside a Card game, as well as a soon to be released Roleplaying game. 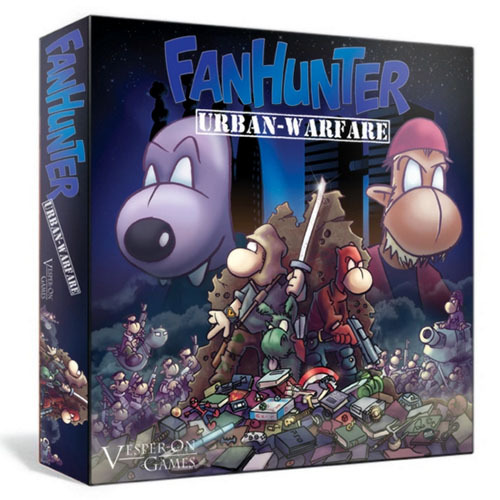 In Fanhunter, players participate in a ‘revolution of the nerds’, as a tinpot dictator has outlawed every aspect of geek culture. The Resistance, made up of nerds with abilities inspired by pop culture icons, must do battle with the titular ‘Fanhunters’, a group created by the dictator to wipe out all things fun. We also talk about ‘Dragons & Chickens’, a fast reaction game which involves players throwing cards into the centre, before identifying and calling out the most common symbol amongst the pile before the opponents. The twist involves the eponymous dragon whom the players must be the fastest to physically shield their treasure from when he appears to preserve their points. She demos ‘Fast Food Fright’, a cooperative game where players must exchange cards in their hand to produce sets of fast food as ordered by a deck of monsters. All of which must be accomplished before a small hourglass runs out. After she guides us to a narrow victory, I ask a little bit out Devir. And it’s easy to see why, in addition to the board and counters being hand crafted (the adorable spiders are made out of fabric, pipe-cleaners and googly eyes! ), the game can be picked up and played immediately, with a surprising amount of tactical depth. Players take on the role of hungry spiders who must navigate the strings of a web to wrap up and then eat flies that have been caught. The web is suspended over a nuclear reactor – naturally – and as the spiders eat the irradiated flies, they gain mutations which grant them movement powers, the ability to bump their opponents away and so on. Shuffled into the Mutations deck are the ‘Super Mutations’, drawing three of those nets you the game. But not all Super Mutations are positive and players have to manage their drawbacks, leverage their abilities and keep chomping spiders in spite of their competitors. “It’s all been about refining the wording on the cards, some people have been producing interpreting them in ways we hadn’t thought of” says Breck, “Or producing really crazy combinations of cards that we hadn’t intended,” adds Leila. The fact that critique is focused on something that is easily fixable and remote is a testament to the strength of the core mechanic. Finally, we spoke with Gary Sibthorpe about his company, Sibro Games, and their first title ‘Follow’ which they are launching here at the UK Games Expo. “The idea of the game is that you go around and collect Followers and take them home to where they belong. Followers come in all different forms, from Cleopatra to the Labyrinth. As players move around and explore the board they reveal new locations and new followers within them. Kids love it as they can, for example, find the Labyrinth in the Bathroom. To win the game the player must collect a full set of followers by returning them to their home. But other players can also steal one of your followers in transit and try to get them home before you do. 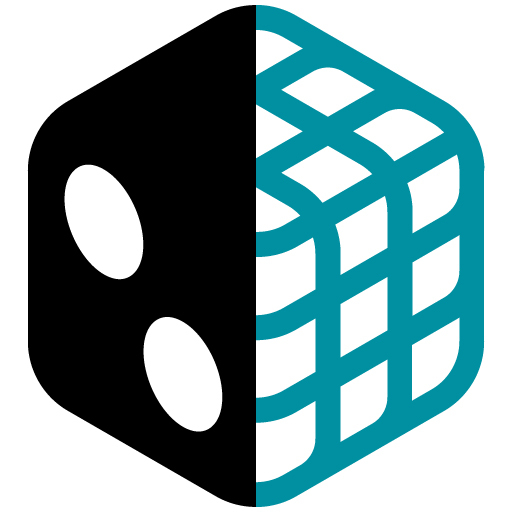 There are no set number of moves you can make on your turn, it all depends on a dice roll on whether you get to make more than one move.” Follow certainly looked interesting and will cater both family gaming and the more in-depth crowd who are more likely to try to build strategies in the game. That seems like a good place to leave it for now. 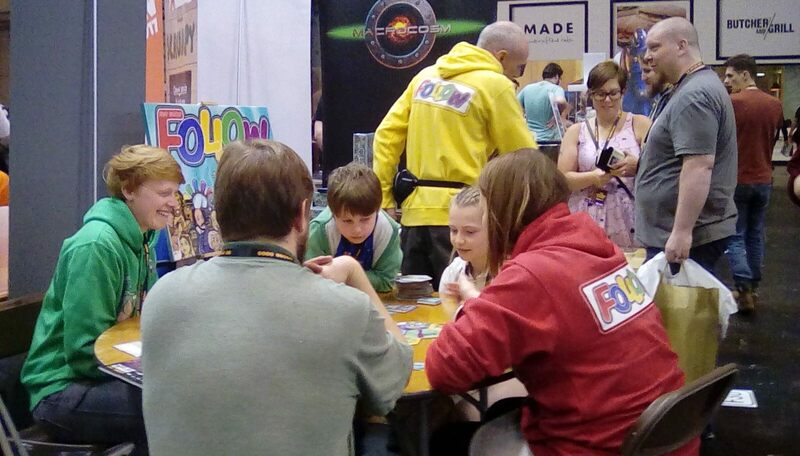 But part two will be along shortly with the mischief we achieved in the evening and some more details on exhibitor’s, events and games at the UK Games Expo.